Alex Woodford is a 22-year old lady from England. 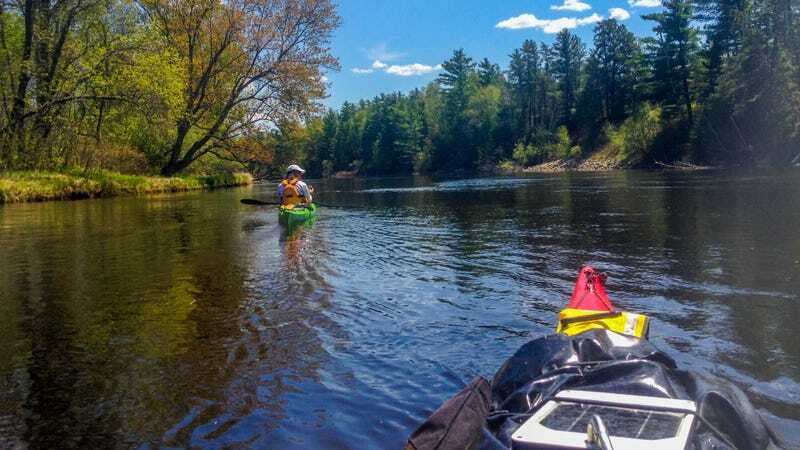 Last year, while the two of us were camping with Bear Grylls, she told me she wanted to kayak the Mississippi from its headwaters in Minnesota all the way to the Gulf of Mexico. And now she’s doing it. — Ed. Lovingly nicknamed the ‘Big Muddy’ on account of its silt-stained brown water, the mighty Mississippi River is widely recognized as one of America’s most iconic waterways. A 2,552-mile-long (from source to sea) expanse, which every year beckons a few brave souls to its banks. People who, with starry eyes and a copy of Twain’s Huck’ Finn in hand, set out from its beginning at Lake Itasca, MN with the sole aim of completing this 10-state all-American traverse, along the (in my opinion) very much underrepresented Midwest to where it empties out into the Gulf of Mexico. Though light on the book and not particularly courageous, I currently find myself one of that number having, three weeks into this kayak-based ‘journey of a lifetime’, completed the area officially recognised as the ‘Headwaters’. A milestone which has left me feeling buoyed in so much as I have successfully negated my way through the ‘wild’ stage of the trip and hence couldn’t have been as woefully under-prepared as I had secretly suspected upon departure. Reflecting back, I and my equally mosquito bitten partner in this undertaking, Amit, now seem an age away from our first day, where as an optimistic and clean pair of paddlers we took to the much talked and dreamed about Headwaters sure that the end of this section, finishing under the bright lights of Minneapolis, was a few weeks’ cruising away. A day which, though unable to dampen our fresh-faced enthusiasm, nevertheless threw a bucket of icy cold river water in our faces as the realization dawned that this was actually going to be very hard work. I’ll be honest, after a quick, early morning Angry Orchard-based christening (it’s tradition for new boats, right? ), and a gentle glide in our Wilderness Systems kayaks across the beautifully calm Lake Itasca to the source of the River we felt pretty confident in our abilities. But, after entering the narrow, fast flowing channel it rapidly became apparent that our 17ft boats, while perfect for the upcoming days, were not ideal for these lush, winding sections of waterway, which often only stretched in width to two thirds of the length of our boats. The fallen trees and, on occasion the beaver dams, that lined the route often proving a navigational challenge too far for our slightly bedraggled hero, Amit, who ended up getting close and personal with a significant number. I, on the other hand, sent out an unintentional offering to the river gods in the form of my, though not long owned, much loved pair of surf glasses and a borrowed wooly hat. Still, as the day drew to a close, and we found ourselves in an epic race against the gathering thunder clouds to our home for the evening, we found ourselves smiling and laughing (admittedly a little hysterically) at the surrealness of starting this estimated 2.5-month long adventure — The Big American Paddle. Time after that passed by in a blur, the river persisting from claiming any more of my belongings, as night after night arms tired and stomach muscles sore we watched the sun fade from the comfort of our Brooks Range tent in whatever ‘primitive’ DNR watercraft campsite we had put up at. The days filled with so many trivial but amazing experiences as we sequentially: travelled through insistently winding wetlands (I think I’m not exaggerating to say we travelled 1 straight line mile for every 10 we paddled); defied the elements as we were snowed upon whilst crossing the white-tipped Lake Bemidji (our brilliantly lightweight Adventure Technology paddles feathered to a gust-fighting 45 degrees and wind-beating Bomber Gear splash tops securely tightened to keep out even the most devious of flakes); survived the 16-mile crossing of Lake Winnibigoshish (its name in Native American — according to Wikipedia — tellingly translating to ‘miserable wretched dirty water river’); portaged far too many dams; had the pleasure of chatting to, and staying with, three brilliant sets of ‘River Angels’ (experiencing Minnesotta niceness at its best! ); became one of the last to pass through the now permanently closed St. Anthony Falls Upper Lock; cumulatively ate way too much porridge (oatmeal for you guys) and couscous; and, finally, reached and paddled through the first of our three big cities in the form of Minneapolis. Now, with our terrain more uniform — in all honesty the big expanse of river I had envisioned the Mississippi being — and boats heavily loaded with water (we had to sadly give up our superb Vapur filter bottles after the heavy metal dispensing state capital), we are looking forward to tomorrow, crossing over to Iowa as we start the transformation into a (very, very) small fish in a big river. Alex will be updating us with her and Amit’s adventures, mis and otherwise, along the way. You can follow her on Twitter.